mmmmm, Heath, my nutty little friend, how I love you in my DQ blizzard. Our friends over at Breyer's had the good sense to mix you into an ice cream, and overall, I'm not disappointed, though this bad boy is going to need a second scoop review tomorrow. 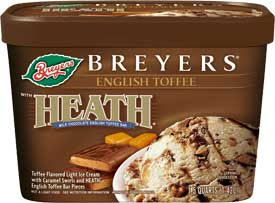 Now this is one of Breyer's low fat ice creams, so it's not all natural, but to be honest, you won't really know. The Heath is strong enough to override any imperfections. For whatever reason, the ice cream wasn't frozen solid, but in this case, it's ok. This is one of those flavors that's quite good slightly melted (basically, reminds me of the blizzard again). So the toffee ice cream is mild, the caramel swirl is nice, and the heath chunks are small and tasty. There seems to be a trend here, the best mixed ice creams seem to build on a mild base. I'll have to keep this in mind for future reviews. I guess my only real complaint is that this is one of the shrunken specialty flavors, so you only get 1.5 quarts. 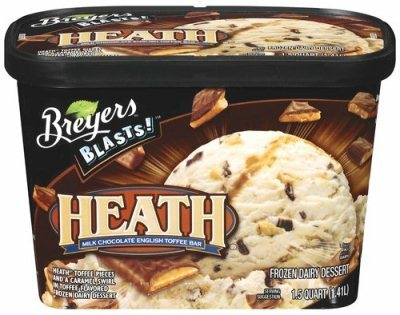 On Second Scoop: oh, I really do like Heath, and I really like this ice cream. My only fear would be that people might find it a bit to heathy, it could definitely be a smidge more mild. For me, maybe 5-10%. To have a wider appeal, maybe 20%. If you like Heath or caramel, give this one a try. Update: This flavor went on to become the Heath Breyers Blasts flavor.